If a chair or car seat backrest is not giving you the right lumbar support you are likely to find yourself uncomfortable, slouching, slumping or even with back pain. This is because the spine does not have support and will not be helped to stay in its safe, healthy shape. 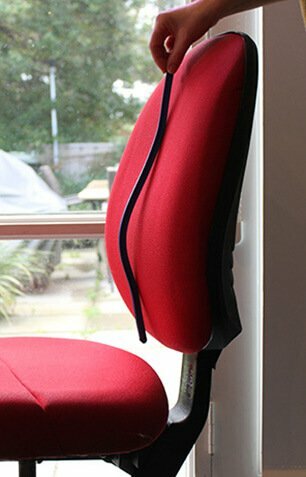 Some chair backrests are so bad that the spine actually slumps into a crescent moon shape. This puts extremely high pressures on the intervertebral discs, stretches ligaments as well as causing other problems for the body. Chairs are made with very different backrest shapes and styles. Some give good back support and some give little! Worse still, some backrests actually force us to slump. People often blame themselves for poor sitting posture but often it is the chair, not the person at fault. We all have different curves in our spines. Some of us have deep curves, others average curves, and some of us only have a slight curve. All these variations are normal; it’s just like some people having high arches in their feet or high cheekbones! When a person’s lumbar curve is more than the curve of the chair backrest it will lead to slumping and flattening of the lower back. If you want to find out if your chair or car seat has enough shaping for your back try this trick. Get a small towel or piece of clothing, fold or roll it into a pad and place it in the ‘small’ of your back – around waist level. If your back feels more supported and comfortable or if you notice you’re sitting better (more upright and less slumpy) – your back curve needs more support. When are lumbar supports needed? 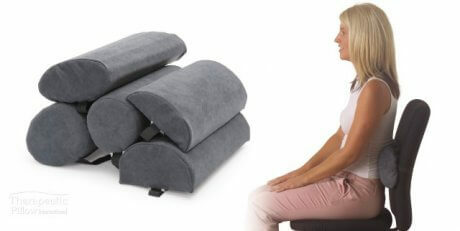 Back Centre has over 25 different back supports cushions – each with a different shape, size and firmness. Some of these are better suited to office chairs and others to car seats. Some are ideal for lounge chairs and others great for travel. If you’re after a lumbar car seat support, when you visit our showroom we will suggest you take a few out to your car to see how each feels. It’s the best way to know what works best. If you need a lumbar support for your home office or home seating you can use our free trial service to test them out. We prefer that people buy a product which they know solves their problem. If you want to know more about lumbar supports please contact us.